My earliest knowledge of the epic ~ Mahabharata comes what I saw on TV as a child. Come Sunday morning and every body in the house would be glued to their television sets watching the epic tale. I was too young to understand it all, the complexity of the plots and characters, the philosophy, the wisdom yet, I was always awe struck by what ever I could grasp and even today, if I think of Mahabharata, glimpses from the TV series comes flashing in my mind. I am so glad that I could relive that experience in Chitra Banerjee Divakaruni's The Palace of Illusions though not in its entirety or fully, but in a new way, in a new perspective that added a multitude of dimensions to the legendary tale. Divakaruni chooses Draupadi also known as Panchali, to narrate the epic saga and that is the charm of the book. It is in fact a feminist interpretation of Mahabharata. Vibha had recommended me this book when I had set out a list of to read books and I am glad to have picked this up. Thanks a lot Vibha! The novel traces Panchaali’s life, beginning with her magical birth in fire as the daughter of king Drupad before following her spirited balancing act as a woman with five husbands who have been cheated out of their father’s kingdom. Panchaali is swept into their quest to reclaim their birthright. 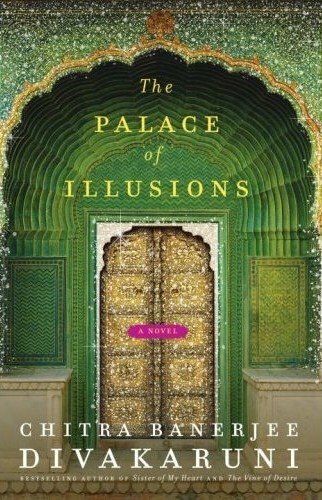 As she endures a fierce civil war, domestic power struggles, her complicated friendship with the enigmatic Krishna, her love for her brother and the perils of attraction to elusive men, who also the most hated enemy of her husbands, Panchaali brings a feminine sensibility to her male-dominated world. The novel is named after the palace which was built by the asura Maya for the Pandavas and Panchaali . Panchaali loved her palace and was proud of it. It disintegrated when Duryodhana tried to claim it after the Pandavas had lost it in a game of dice to him. Though most of the story narrated comes from the legend tale, Divakaruni adds her imaginations and explores the mind of Panchaali. She gives insights to how she felt when she was born and was prophesied to be one to change the course of history, to bring about the greatest and the bloodiest war of all times. She tells us through this book, how she felt when she was humiliated in the Kaurava court and how the incident filled her heart with revenge and the vow she made at that time lead to the battle that wiped of the whole Kaurava clan and all those who supported them. Panchaali also reflects on her own actions, good or bad and even justifies them. I could sympathize with the character the author had painted of Panchaali and even could relate to her at some points. Divakaruni has very skillfully retold the story from the viewpoint of Panchaali adding her own twists and turns which made it even more enjoyable, refreshing and enlightening read. I would recommend it to anyone interested or not interested in Indian mythology. I am sure it will change the way you think about the epic ~Mahabharata. Jyoti, I am glad you enjoyed the book. It was a pleasure reading your review of this book. Just finished reading 'Jaya' - retelling of Mahabharta by Devdutt Pattanaik (you can find the review on LiterarySojourn) and really liked that too.